Do you love to take selfies, and want to be able to take them in just one step? EMUI 8.0 offers app feature shortcuts for you to use with your most frequently used features, letting you add them to the home screen and open them in a single step. Using shortcuts to access frequently used features:EMUI 8.0 has added shortcuts to access frequently used features. 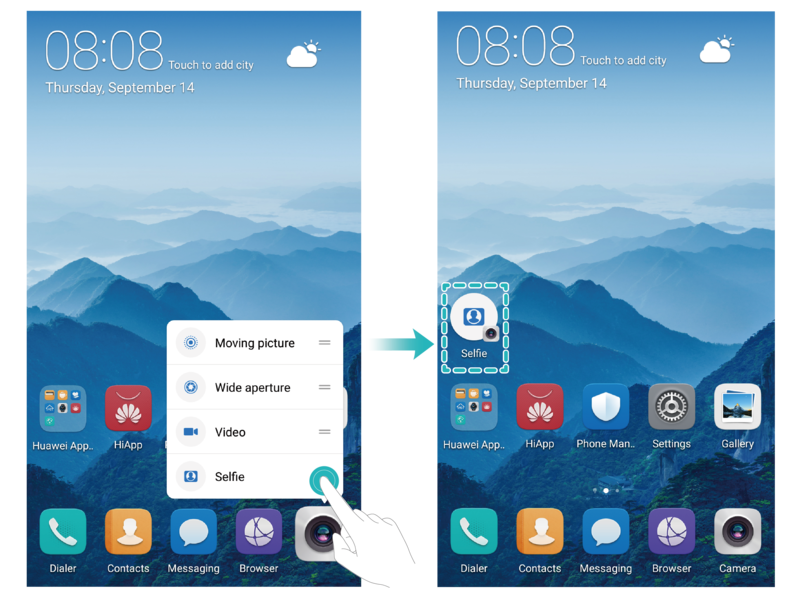 On the home screen, touch and hold the icon of a frequently used app, and select the desired feature in the pop-up menu to quickly launch it. How to add an App feature shortcut to the home screen:EMUI 8.0 supports adding app feature shortcuts to the home screen. Touch and hold any app icon on your home screen, touch and hold the desired feature in the pop-up menu, then drag it to your home screen to create a feature shortcut.